← The BIBLE? You don’t own one . . . THE HARD CONCEPT – HOW CAN HE BE FLESH? Greek philosophers of the day (since the time of Plato) influenced the culture around them – Hellenized is the word. Dr Craig Keener states that they emphasized that the “Ideal” was invisible and eternal. With this in mind, if we juxtapose this understanding against the backdrop of a Greek society and Roman society of the time (and the understandings long before that time as well) where Emperors were considered to be a god – where Pharaohs were considered to be a god, it is not too hard to understand the Jewish polemics and apologetics against such things . . .
We can also easily surmise that if God had NOT dwelt in the tabernacle already – in the tent of meeting – that the Jewish people would have argued against this being a possibility as well, and for the same reasons that they argued that God could not be flesh- – – because the pagans ALSO believed that god’s could and did dwell among them. Think about that for a minute and consider the impact of society on religious views (both good and bad – both pagan and Holy) – contrast them and use some discernment . . . For example, Jews today do not prostrate themselves – they daven – they do this to be separated because the Muslims prostrate themselves . . .
His ways are not our ways and His thoughts are not our thoughts BUT He did create us and He knows OUR thoughts and OUR ways – He knew how to communicate with Avraham and Moshe – he knows how to present himself so that people will believe – – – sometimes that is though his angel inside a donkey – sometimes that is through his angel in a burning bush . . . sometimes He swallows you with a giant fish – sometimes he turns you into a pillar of salt – sometimes he sends frogs . . .
Is ANYTHING too hard for HaSHEM? God can speak from a burning bush but can not become flesh? Is THIS too hard for God? Is he limited to pillars of smoke and fire? Is he limited to plant life? 12 For now we see obscurely in a mirror, but then it will be face to face. just as God has fully known me. the Sh’khinah of the Father’s only Son, full of grace and truth. 4492. σκηνόω skēnoō verb To live, dwell, tabernacle. 30 “You are to erect the tabernacle according to the design you have been shown on the mountain. 31 (v) “You are to make a curtain of blue, purple and scarlet yarn and finely woven linen. Make it with k’ruvim worked in, that have been crafted by a skilled artisan. 32 Hang it with gold hooks on four acacia-wood posts overlaid with gold and standing in four silver sockets. 33 Hang the curtain below the fasteners. Then bring the ark for the testimony inside the curtain; the curtain will be the divider for you between the Holy Place and the Especially Holy Place. 34 You are to put the ark-cover on the ark for the testimony in the Especially Holy Place. 35 “You are to put the table outside the curtain and the menorah opposite the table on the side of the tabernacle toward the south; put the table on the north side. 36 “For the entrance to the tent, make a screen of blue, purple and scarlet yarn and finely woven linen; it should be in colors, the work of a weaver. 37 For the screen, make five posts of acacia-wood; overlay them with gold; and cast for them five sockets of bronze. 43 There I will meet with the people of Isra’el; and the place will be consecrated by my glory. 44 I will consecrate the tent of meeting and the altar, likewise I will consecrate Aharon and his sons to serve me in the office of cohen. 45 Then I will live with the people of Isra’el and be their God: 46 they will know that I am Adonai their God, who brought them out of the land of Egypt in order to live with them. I am Adonai their God. Exodus 40:34-38 (CJB) 34 (Maftir) Then the cloud covered the tent of meeting, and the glory of Adonai filled the tabernacle. 35 Moshe was unable to enter the tent of meeting, because the cloud remained on it, and the glory of Adonai filled the tabernacle. 36 Whenever the cloud was taken up from over the tabernacle, the people of Isra’el continued with all their travels. 37 But if the cloud was not taken up, then they did not travel onward until the day when it was taken up. 38 For the cloud of Adonai was above the tabernacle during the day, and fire was in [the cloud] at night, so that all the house of Isra’el could see it throughout all their travels. Do we follow the logic and understanding of the times – the culture? Do we follow the one true God who MADE time – who MADE the world that culture resides in? 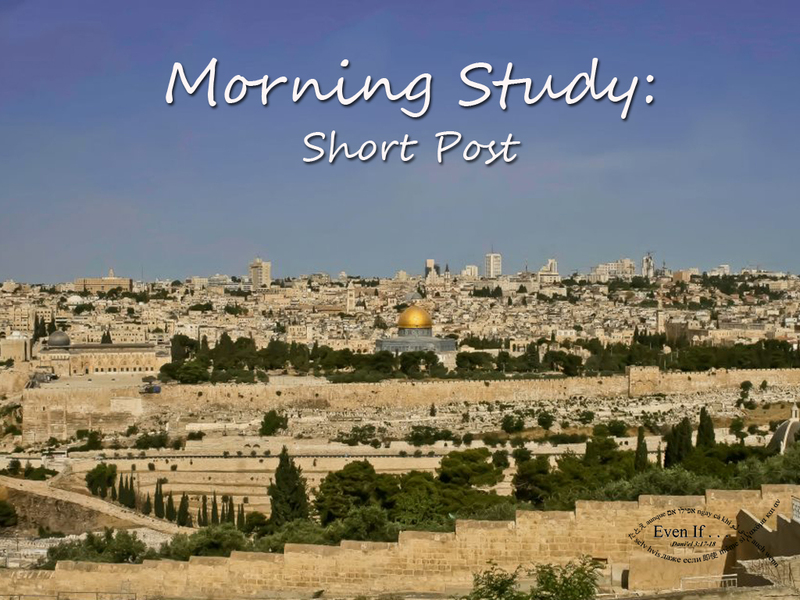 This entry was posted in MORNING STUDY - Short Post and tagged dwelt, flesh, tabernacle. Bookmark the permalink.